Over the summer, I've been perusing sites, checking books at the library, making up my list (and checking it twice) and generally being in the thought process part of planning for Christmas gifts. Today I wanted to show you some of the inspirations for my gifts-to-make list (and keeping fingers and toes crossed that no one on my list will figure out who is getting what). The spa cloths. Yesterday, I was asked if a spa cloth was the same as a washcloth. Yes! But doesn't "spa cloth" sound so much more, um, gift-like? So, if anyone on my list receives a washcloth from me, it's not that I think you need bathing, but more along the lines of pampering. 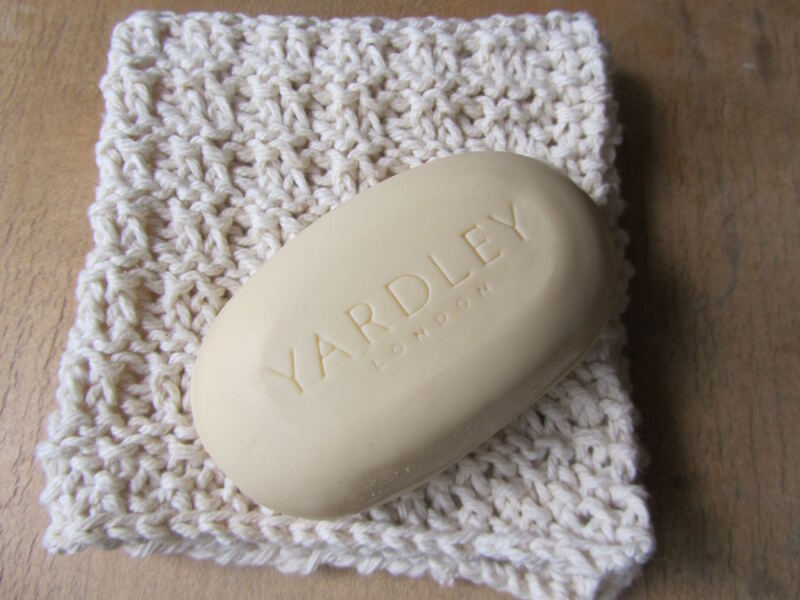 Also, as either a knitted or crocheted cloth, it has more texture than a terry cloth, better for exfoliating and invigorating the skin. Looks really, really lovely, right? 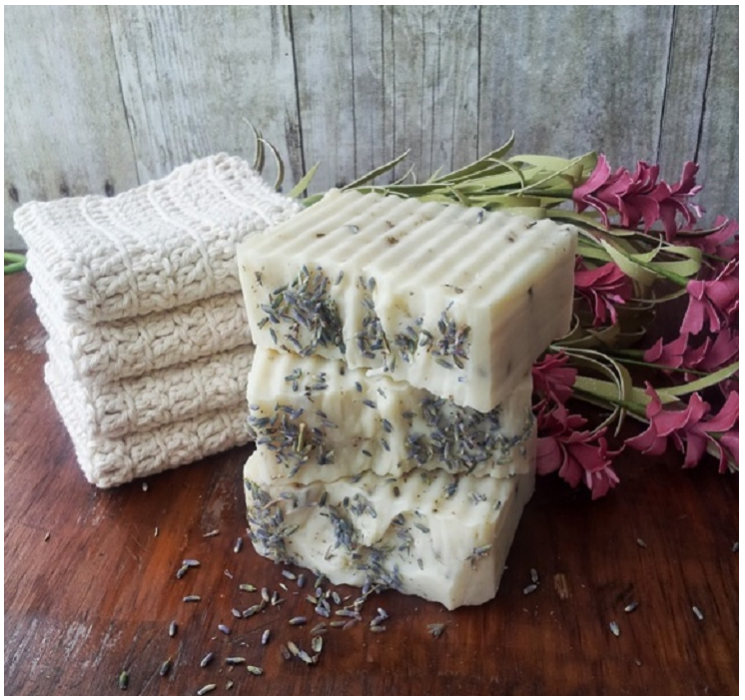 4 spa cloths and 3 bars of homemade hand-crafted soap. The spa cloths in the photo look crocheted, to me. I was going to try to learn to crochet just to do these. But the learning would take extra time. And I figure I should play to my strengths, and not weaknesses, with putting gifts together. I knit the cloth following these directions: from ravelry.com, the pattern by Anne Mancine. It's a waffle knit pattern. Other than that, the pattern knitted up perfectly. I measured after 13 repeats, and it was perfectly-sized for finishing off with the repeat of rows 1 & 2, then seed stitch edging. 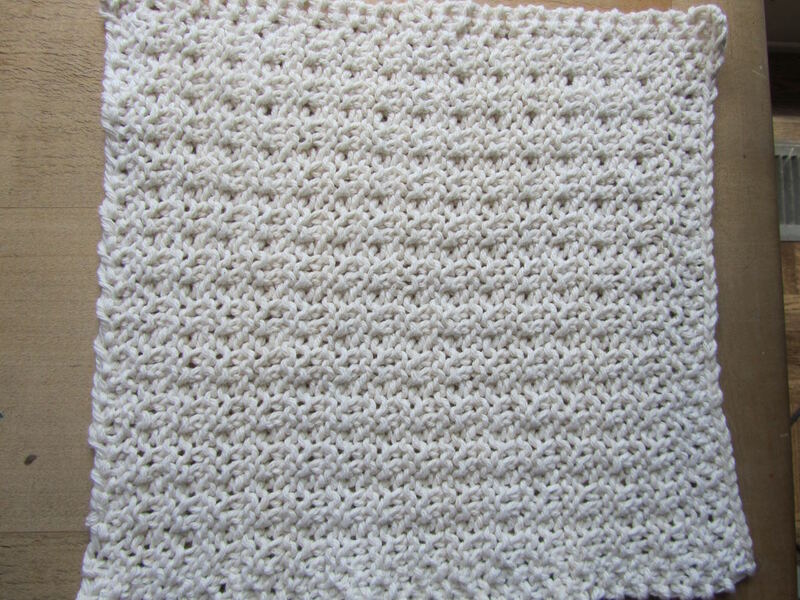 Although there are more rows and stitches to knit than the dish cloth, it knits slightly faster, due to a couple rows in the pattern being quick to knit (almost all K or all P for a row). Aside from being slightly larger than a dish cloth, it's also slightly stretchier, which I think is more appropriate for a bath/spa cloth. The cost of one spa cloth is under a dollar, with yarn bought on sale, using slightly less than 2 ounces of yarn. Like I said, I will do a melt and pour soap base. 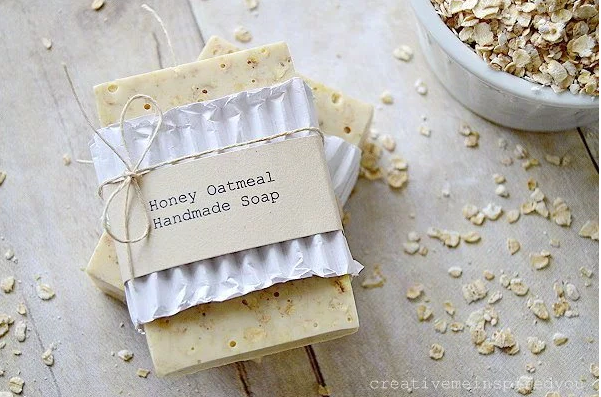 I'll be making goat's milk, honey-almond-oat, skin-soothing bars. 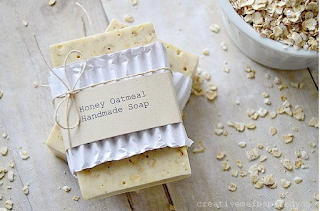 I'll use a goat's milk base, along with ground oats, camomile tea, sweet almond fragrance oil, vitamin E oil, and honey. 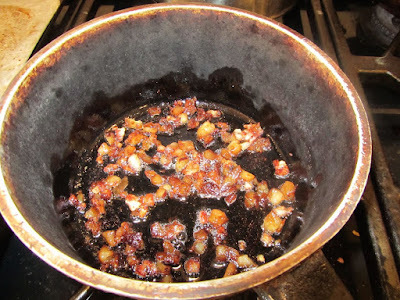 I'll combine several different recipes to get the skin-soothing product that I'm after. Instead of buying a mold for the bars, I'll pour the melted soap into a cardboard box, lined with waxed paper. Then I'll cut the soap slab into bars. Melt and pour soap doesn't require the long curing phase that cold-process soap needs. So, I can take my time accumulating the ingredients. Which brings me to this -- these gifts would not at all be frugal if I just tooled on down to the craft supply shop and paid full-price on every ingredient. I'm using coupons and sales to accumulate all of the ingredients, one by one. And that's why it's been so important for me to begin the Christmas planning so early. So, I can take my time accumulating the ingredients, as well as time for the actual crafting. I've got a 40% off coupon to Michael's right now, and will get the soap base this week. A 2-lb block of soap base will yield about 8 bars, if poured into a small-ish snack cracker box, then cut. (Looks like we'll have to eat a box of Dollar Tree snack crackers -- oh, the sacrifices!) I'll check out their fragrance oils at the same time. but if I can't get that at Michael's, I've found something on Amazon that is a good price. I'll use the large-size, empty tea bags (available through Amazon, at about 6 cents per bag, bought in 100 pack), and fill with a rose petal, milk and colloidal oat blend. I've been drying and saving rose petals all summer. Colloidal oatmeal is simply oats ground to a fine powder -- I can do that in my spice grinder. And I'll use either powdered goat's milk (in the powdered milk section of the grocery store, or in bulk from a natural foods store) or ordinary cow's milk powder. By putting this into steeping bags, the tub doesn't get so messy (as opposed to a jar of tub tea/soak). 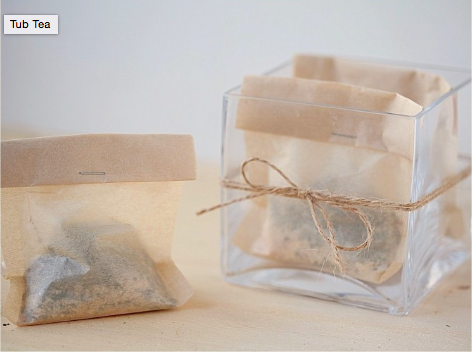 The Amazon bags are biodegradable/compostable, as they are simply paper tea bags. 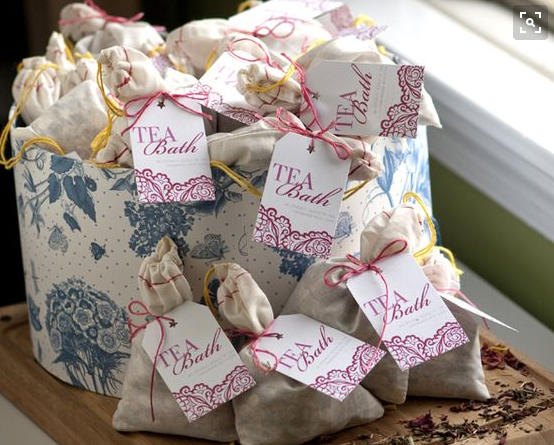 The cost per filled, individual bath soak bag should be around 30 to 40 cents, depending on extras that I decide to add, like rose fragrance oil, and if I splurge for the goats milk. These are all small gifts, no liquids, and easily shipped. They make great girlfriend gifts, teacher's gifts, daughter/mom/sister gifts, stocking stuffers, as well as bridal shower favors. And I can make all of the items, fairly frugally. Anyways, this is my start on the spa collection for Christmas gifts this year. These gift ideas are lovely, aren't they? I've had fun collecting the photos on my computer. You definitely have a way of putting things together to look nice whether it's for your house or for a gift. As, CT said, "Lovely!" I just follow what others before me have done. And if it looks like something I'd like to receive, it makes my list. Handmade soaps are nice gifts too. The recipient will love the thought and care that went into making it. 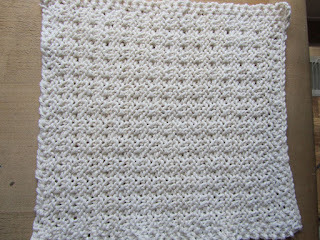 You know, the other knitted pattern I used for the dish cloths, was a tighter knit, and felt better for a dish cloth, to me. I think that one will be a better dish scrubber. I like giving consumables, like soap, as practically everyone can use it up at some point, and it won't sit in a cupboard for years. ha ha! But stay tuned. I may have some sort of giveaway, as we near Christmas, with some of the extras I make. Very nice gift plan, Lili. The recipients will be lucky to receive these. I do agree that consumables make the best gifts. Using a box for the soap mold is a great idea. I found the box idea online, somewhere. I thought it was a great idea, too. Someone else had done this and I thought how perfect. No need to buy a mold or build a wooden mold. Oh wow, I love all of these ideas and gifts. :) They are so beautiful. It's fun to plan and dream. There are so many fabulous ideas online. I am in the process of making a spa box for friends. The cloths would be a great and really pretty addition, but gee I hate knitting! Maybe you could add a couple of things from Dollar Tree, like body scrub brushes, or a luffa, or a pumice stone. grounds to the soap and called it gardeners soap. 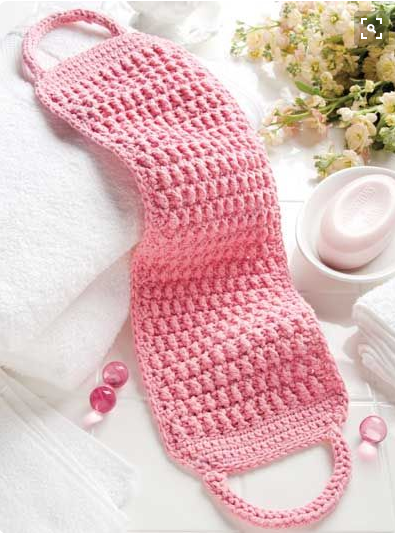 it would make a nice gift if I crochet the spa cloth? Oooh, that's nice to know, the price on hand-crafted soaps. I love that idea for a shaving mug. My husband used to use a shaving mug and soap/brush. I would buy him a round bar of shave soap every year. But I could make the round soap, now, couldn't I? I think a crochet spa cloth would be lovely. That's what the cloth in the photo with the lavender soap is, I think. I think that pattern is beautiful. I wish I could make it, and am thinking of dropping a not so subtle hint to my daughter who enjoys crochet, that Mom would love that. I've officially started my list and have one person's gift about halfway finished. I am tatting her a dozen ornaments. Beyond that I know what I am buying one or two people. I did take the time to pin some possible projects for my older nieces. I just haven't decided yet. However, since I will start back to school in October, I know I need to get busy now. Oh those ornaments sound beautiful! I can relate about how busy you get once classes start up again. Fall is such a busy time of year for me, that getting many Christmas and birthday gifts taken care of in summer is a real help. 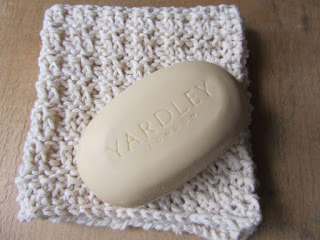 I loved the photos....I dont know how to knit or crochet or make soap! but they look like such nice gifts to give or receive at christmas. I am looking for inexpensive gift ideas - especially this year....my husband is battling cancer - and we are winning the fight! but as you can imagine, the expenses are so high - even after insurance....thank you so much for sharing...I look forward to more of your christmas gifts posts!! 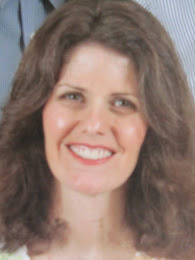 I am so glad to hear that your husband is doing so well with the treatments! May he continue to win this battle. Okay, so for making melt and pour soap -- it's super duper easy, no skills required. As I make the soap, I'll post pictures and how I did it as frugally as possible, in case it's something that may be a possibility for you, for gifts. It's not at all like "cooking" soap, where you mix lye and fat. Melt and pour comes as a large block of soap that you add fragrance, color and any extras you want. You pour it into some sort of mold. You can use small plastic containers (like yogurt containers) or a large container (like a box, lined with waxed paper) and then cut into bars. But anyways, I'll show some photos when I get to that in a month.